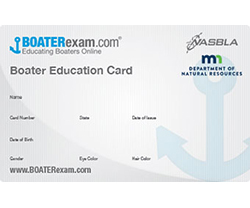 Complete the online boating safety course at Online Boating Course to receive a youth Minnesota watercraft operator's permit (12 to 17 years old). In addition, this course may be required for youth and adults plan on boating in Canada. Adults wishing to learn more about boating safety are encouraged to take the course and maybe eligible for a discount on boat insurance —check with your insurance agent. Learn more about boating and water safety. Organizations such as U.S. Coast Guard Auxiliary and U.S. Power Squadrons offer free or low cost education programs and publications. 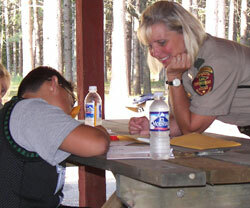 To find a boating safety classroom course, visit the DNR’s Event Calendar or call BOAT/U.S. at 800-336-BOAT. The Minnesota Boating Guide (2.8 Mb) summarizes Minnesota's boating laws and regulations in an easy-to-read form. It supplies the information that most boaters need to know about operating watercraft on the state's lakes and rivers. Look at the boating and water recreation regulations pages for other laws.